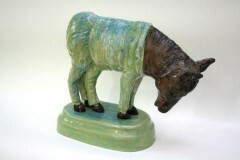 Installation artist Laura Ford combines mould making and slipcasting techniques with a sculptural sensibility in her series of animal forms. Created through methods traditionally associated with mass production, Ford’s figures and the plinths they rest upon point towards the properties of commemorative souvenirs, literally and metaphorically elevating the banal and inconsequential to a higher plane. The hand-built, porous quality of Claire Curneen’s terracotta Trees (2007) evidences the mark of the maker, while their intricate interwoven golden roots and branches simultaneously suggest tensions surrounding the monetary and personal value of ceramic objects as artistic outcomes. Co-curator Lowri Davies’ four decorative slipcast vases, Roots (2011), develop themes of personal heritage and placemaking to position the ceramic vessel as a container of experience and emotion. Visualising aspects of her own background, the transferal of Davies’ pen and watercolour drawings of the Welsh landscape to the vessels’ surfaces and her intermittent application of gold lustre on their rims alludes to both the domestic and nostalgic capabilities of ceramics. Having lived and worked in England, Wales and Scotland, the second curator, Dawn Youll, unpacks the physicality of the built and natural environment. Youll’s reproduction and arrangement of otherwise disparate objects in slipcast earthenware operates to subvert our perceptions of form, colour and scale. 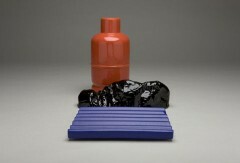 In Sunset (2009), a burnt orange utilitarian canister, a mountainous black mass and an angular undulating blue slab are arranged as still lifes or miniature theatrical sets to evoke an imagined location and corresponding internal narrative. In a similar sense, English born artist David Shrigley’s Untitled (2010) juxtaposes a pair of crude hand-built oversized boots and a bomb-shaped object, united in a flat black glaze. Whether or not acquainted with the naive aesthetic and wit of his primarily two-dimensional work, we can begin to construct accompanying captions to qualify and explain the work in our own terms. 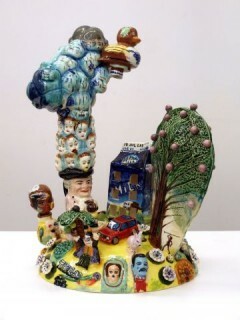 Interrogating notions of consumerism, globalisation and commodification, Stephen Bird objectifies his experiences of growing up in Staffordshire and directly references its connections to traditional mass-produced decorative ceramics. By actively harnessing familiar ceramic signs such as flowers and the toby jug together with milk cartons, graffiti-covered rubber ducks and Freddy Mercury’s head, How we live in the suburbs (2009) is as much a comment on the developing status of contemporary ceramic practice as it is on the continuous reproduction and repackaging of our media-driven consumer society. 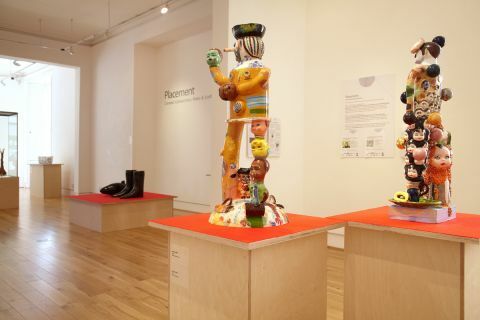 Placement – Ceramic Connections: Wales and Scotland showcases ceramics in an increasingly innovative way. Through a sensitive and considered layout, the exhibition explores established conventions of museum culture in terms of display and public access. By recontextualising Ford’s domestic figurines and Curneen’s sculptural forms in glass-bound landscapes, we can begin to question the functionality of ceramic objects as repositories for memory and meaning. Conversely, the display of Youll and Shrigley’s vignettes on lower level uncovered plinths promotes viewing from various positions, thus evoking multi-layered, open-ended and viewer-specific interpretations. The concept of inclusivity is enhanced further in an adjacent room. 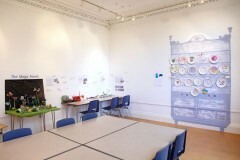 Here, visitors are invited to remodel their past, present and future in plasticine, or to commemorate their heritage by hanging decorated paper cups and plates on an image of a Welsh dresser. While a logical starting point, the exhibition’s focus on collating artists with links to Wales and Scotland becomes slightly tenuous and somewhat lost in a sea of objects and emotions, and it is apparent that the connotations of placement should not be taken entirely literally. It appears to be less concerned with defined geographical locations and more on how we organise and arrange our often ambiguous and contradictory social, cultural and personal identities through visual and material means. The hands-on nature of ceramic practice permits experimentation, liberation and freedom of expression. Although striving to transcend the confines of the creative visual disciplines, the exhibition’s potential to explore everyday artefacts we may take for granted and the intersubjectivities of the ceramic designer and user is overlooked. As a result, it maintains a distinctly fine art flavour. However, like each of the works exhibited, definitions and titles are not set in stone, and Placement reminds us that ceramic practice is malleable, flexible and useful in a multidisciplinary sense. It is therefore not imperative to grasp the relationship between the content of the exhibition and the history of ceramics in general. Rather, the emotional bond formed by the pieces’ symbolic devices encourages us to reflect on how our geographical, cultural and social histories inform our future aspirations, to re-evaluate the meanings we invest in material culture and our surrounding physical environments, and to consider their impact on our individual and communal identities. By demonstrating the value inherent in subjective interpretation, the exhibition exemplifies how even the most personal expressions of experience can reach out to connect with a wider audience. Cara Broadley is a practicing ceramicist and illustrator.Â Her previous work has investigated notions of commemoration and identity through materiality, decoration and the context of the image.Â Currently in her second year of PhD research at the Glasgow School of Art, Cara explores how a combination of social scientific and creative visual data gathering methods can impact upon a people centred design process.